Duran Duran updates – Chain D.L.K. Hope you’re enjoying your summer! If you need to cool off from the heat, check out these two new In the Studio video updates from Roger and Nick! We recently started a new Photo Gallery in the Media section of the site. You can see new snaps here: 2010 Gallery. When you visit the Gallery, you can see some photos of Simon and Nick at the Raisa Gorbachev Foundation fundraiser. Simon performed at the star studded event; read more here: Gorbachev Foundation. Feeling prolific, John also added a terrific Blog to the Writing section of the site. Catch up on a project dear to his heart: Blog from John. Have you been to the fan community lately? June featured TWO exclusive Katy’s Kafes with Nick and John, exclusive videos, a contest where one lucky winner got to see Roger and Jake DJ in Italy and more!! 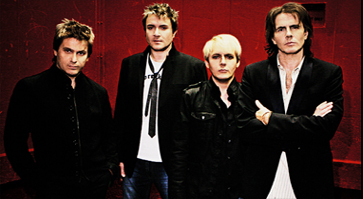 Visit the official fan community at Duran Duran Fan Community.